It seems like you never have enough storage space. When your closets overflow, you try to create more space by reorganizing or you pack up seasonal items and move them to the attic, or maybe you finally purge your wardrobe. 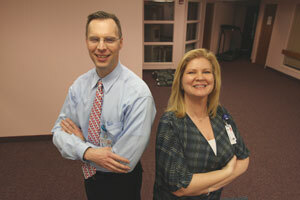 Last year, Matt White, financial coordinator for Akron Children’s Mahoning Valley, and Lisa Taafe, MSN, RN, CNP, clinical administrative director for Akron Children’s Mahoning Valley, recognized they had a storage problem at the hospital’s Beeghly campus. They were running out of storage space, putting items in vacant clinical areas, and storing items in three different buildings across the campus. Because storage space is a complex and overarching issue, White and Taafe chose to address it as their Lean Six Sigma Green Belt project, with an aim to reduce storage space at the Beeghly campus by at least 30 percent. The Storage Allocation Project Team was born and members began surveying departments about storage management. They quickly learned that most items in storage were left over from a previous owner. They also discovered that no specific department had ownership of the items in storage, so the team met to make decisions about the future clinical use of each item. The survey also revealed that expensive, non-occupied clinical space was being used to store supplies, equipment and furniture. When the project started, there was 7,038 square feet of storage space, but through efficiencies the space was consolidated to 4,378 square feet. The project resulted in savings and cost avoidance of about $516,000. The process also involved two Kaizens, the Japanese technique of achieving great and lasting success through small, steady steps. The results: A reorganization of the Central Supply warehouse and a “5S” plan (sort, set, scrap, shine, sustain) for used furniture and medical equipment in all storage areas on campus. “We achieved a 34 percent reduction in on-hand inventory in Central Supply and improved the supply process as a result of becoming ‘lean,’” White said. To clean up the storage issue, some furniture and used medical equipment was sold and the funds were used to purchase bins for Central Supply. Other items were donated for community benefit or returned to the Akron campus. This project also identified the need for easy access to emergency management supplies, resulting in the purchase of an emergency management trailer. The control plan for managing storage at the campus now includes use of a new storage request form that is reviewed and approved by the facility manager.